THE WORLD IS NOT ENOUGH —-remember all the great stuff from this one? Me neither. Pierce Brosnan again does what he can with a boring plot, this one involving oil pipelines, renegade ex-KGB agents-gone-terrorist and.. it’s just not important. Decent bad girl antics are exhibited by Sophie Marceau, and pretty Denise Richards plays a nuclear physicist, which was good for a number of derisive snorts back in 1999. Directed by Michael Apted, running 128 minutes, it ground up $135,000,000 to produce and regurgitated $362,000,000. Bond charges around Azerbaijan, Spain and Turkey as well as good old England. With Robert Carlyle, Robbie Coltrane, Judi Dench, John Cleese and an eye-popping knockout named Maria Grazia Cucinotta (once, God). The End, but James Bond will be back…. Loved the opening of this film, wow! Sad about the way Llewelyn passed on. 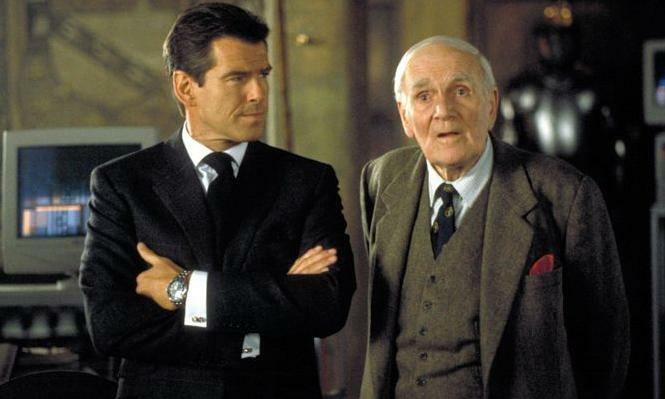 Brosnan and Llewelyn’s scene in this one suggested a real chemistry was developing between them.